A 10-day solo art exhibition titled 'PEACE' by artist Proshanta Karmakar Buddha will begin in the city's Mohakhali area on Friday, reports UNB. The inaugural ceremony of the exhibition, organised by Gallery Cosmos, will be held at 5:30 pm at Gallery Cosmos, Villa de Anjuman: House 115, Lane 6, New DOHS, Mohakhali. The main aim of the exhibition is to pay tributes to Brigadier General Shaheed Jamil Uddin Ahmad (Bir Uttam) & Faraaz Ayaaz Hossain. 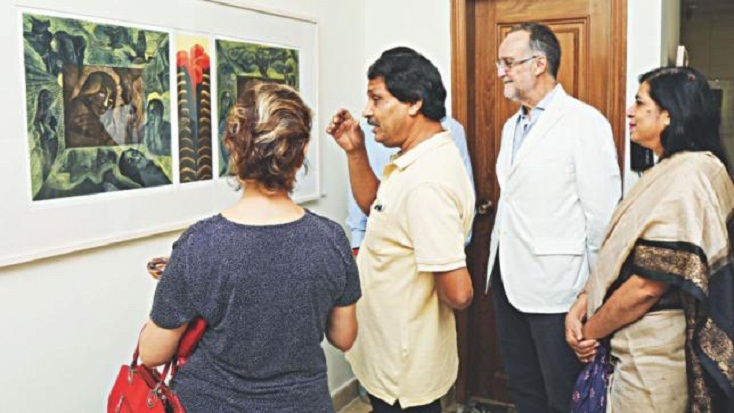 Simeen Hossain, mother of Faraaz Ayaaz Hossain will grace the occasion as the chief guest, while Sidsel Bleken, Ambassador of Royal Norwegian Embassy and renowned art critic and architect Rabiul Hussain will be present as special guests. The exhibition will remain open for public from 12pm to 8pm until December 17.